This chip stock's chart presents a short-term vision of beauty. I thought it might be time to revisit the chart that I threw at you at the beginning of the year as my top pick for 2018. KLA-Tencor (KLAC - Get Report) is up 11.8% year to date, outperforming the Nasdaq Composite as well as the broader marketplace. 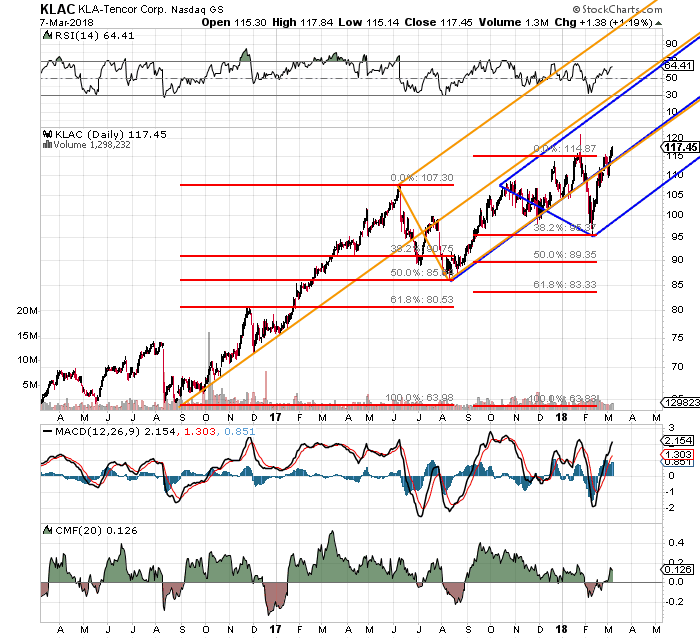 What KLAC is not doing, is outperforming Appled Materials (AMAT - Get Report) (+16.2% YTD) or Lam Research (LRCX - Get Report) (+15% YTD). Guess what? I'm fine with that. As you can see, after KLA-Tencor wobbled a bit over the early part of the year, Relative Strength has been on the rise, but remains nowhere near overbought. The daily MACD (moving average convergence divergence) presents as a short-term vision of beauty. Money Flow had appeared troublesome during the February woes, but looks to have recovered quickly. The orange Pitchfork is representative of some of my earlier work in the name. You can clearly see that the "Flash Correction" broke my model to the downside. I have added a new Pitchfork (blue) that intertwines that market aberration (hopefully) into the work I had already done. Now isn't that telling? Or maybe it's my open bias, because I own the shares, and have publicly been behind the stock, but you do see that, don't you? FYI: I am capable of such bias. My ego does not mind the extra set of eyeballs. It appears to me that all the sharp winter selloff did was add a basement to the model. In other words, my Pitchfork has become a Trident. The shares have made an obvious effort to regain the original setup. The only negative I see here is that the trend has been altered slightly (still higher), but may hit rising resistance at nearly the same levels that it would have prior to the melt-down. Now, if we can only keep those VIX-related ETPs at bay. Equity markets made great strides in that area yesterday. At the time of publication, Guilfoyle was long AMAT and KLAC equity.